They are great for grass-based farms like ours, because of their shorter, upturned snout, they actually graze on grass instead of rooting up pastures. As well as this being better for farms that depend on their pastures and don't want them ruined, it also saves on grain costs as IPP's supplement their diet with grass and hay, AND it makes for a healthier (higher in omega 3's), tastier, and more marbled meat. 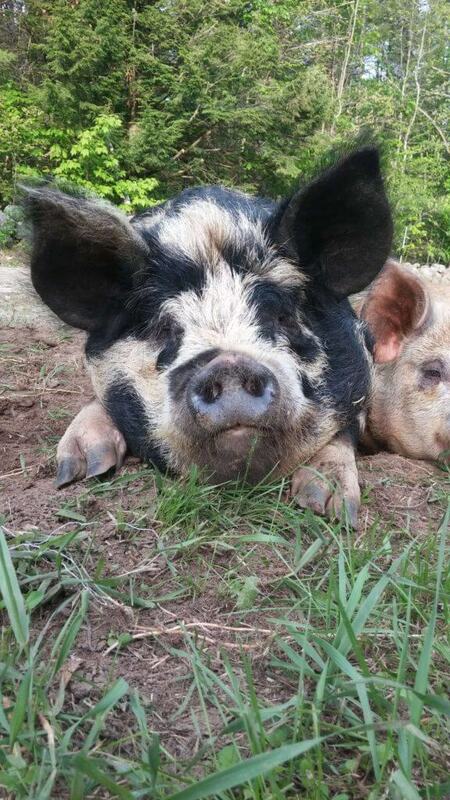 They make excellent, docile mothers and have vigorous, fast growing piglets. 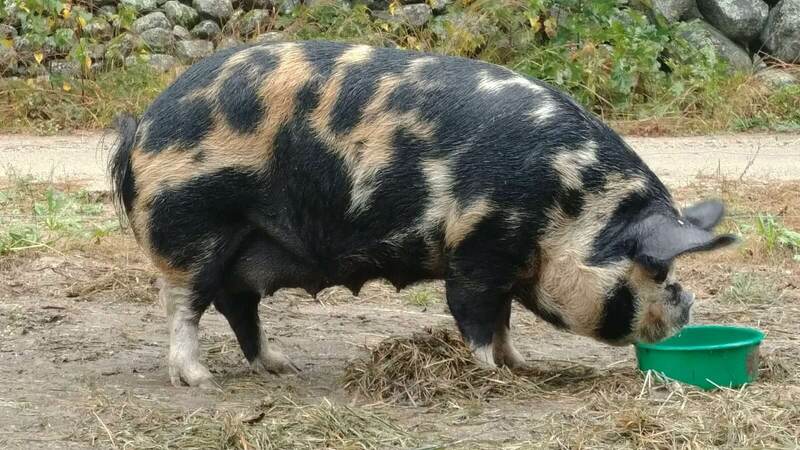 Both boars and sows have excellent temperaments, and as the mature weight for boars is 300-400lbs, and 250-300 for sows, it makes having breeding pairs more feasible to care for year round as their overall consumption will be far lower than larger traditional breeds. Reach market weight (200-250lbs.) and ready for processing at 7-9 months. 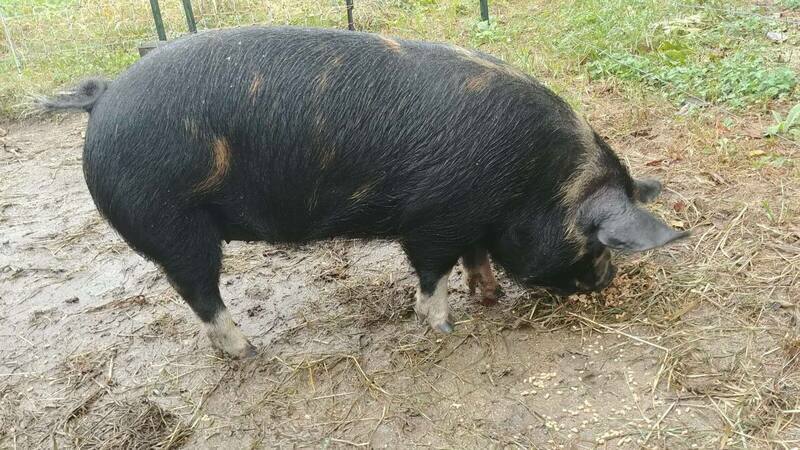 In addition to raising pork for our customers at Courser Meadows, we also have unrelated breeding pairs that we sell feeder pigs and registered breeding stock from. 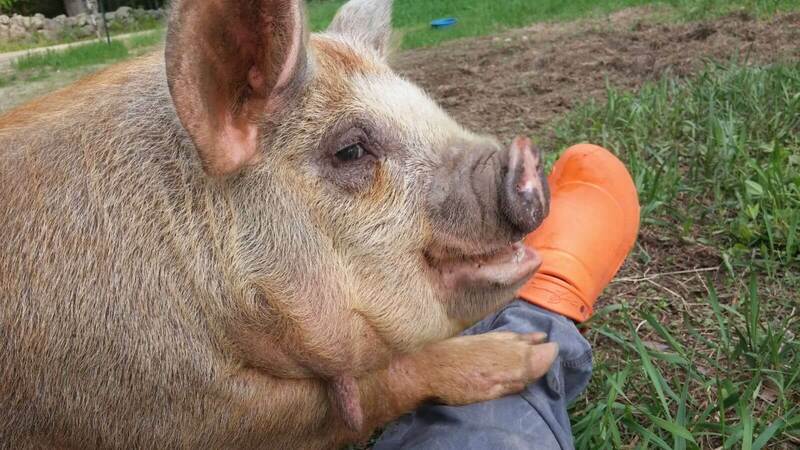 Charlotte (New Moon line) is a tri-color and our favorite pig on the whole farm. She is a perfect example of what an IPP snout should look like. She is a fabulous mother, and her first litter had 8 piglets and her second litter had 11 piglets. 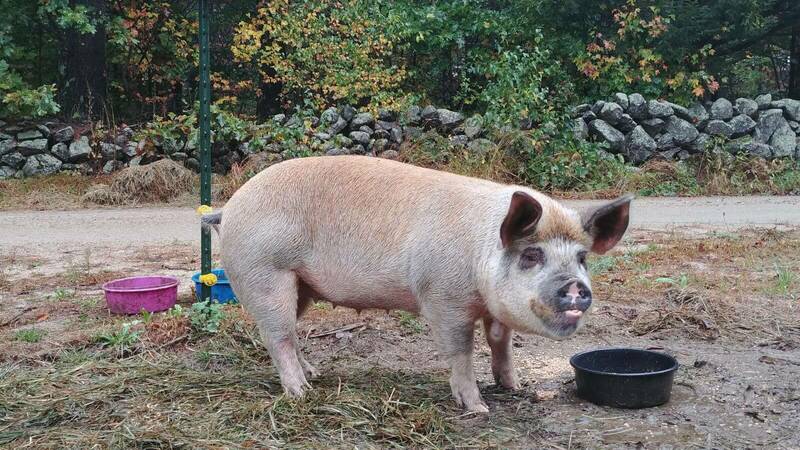 Lottie (Fate line) is a beautiful ginger gilt with lots of personality that joined our farm all the way from Ohio. She has wonderful confirmation and just farrowed with her second litter in September 2018. 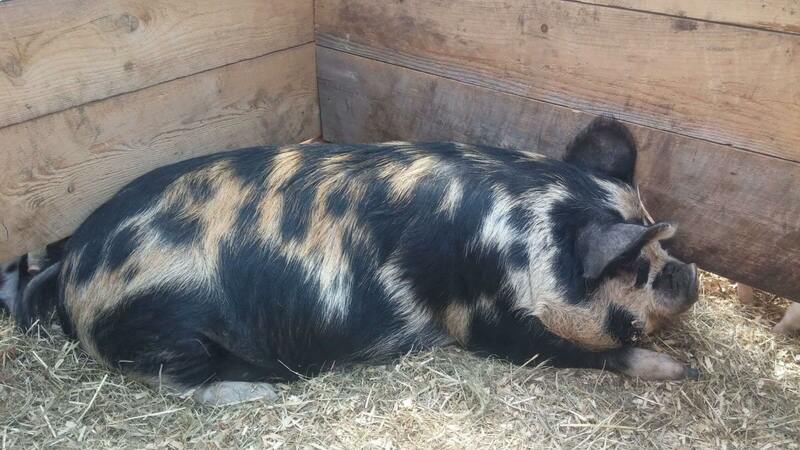 Matilda (Fate line) is another lovely tri-color gilt and is Lottie's full sister from Ohio. She just farrowed with her second litter in September 2018. 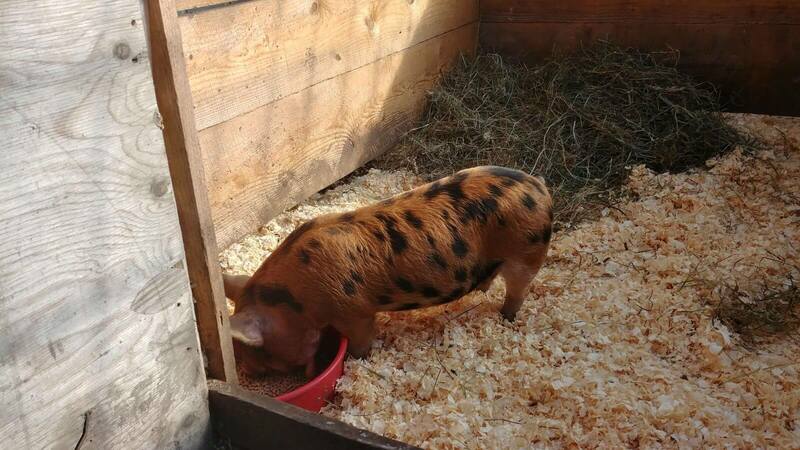 Hamilton (Snickers line) is a ginger and black boar piglet from NY. He's grown since this picture(! ), and sired both of our fall 2018 litters. 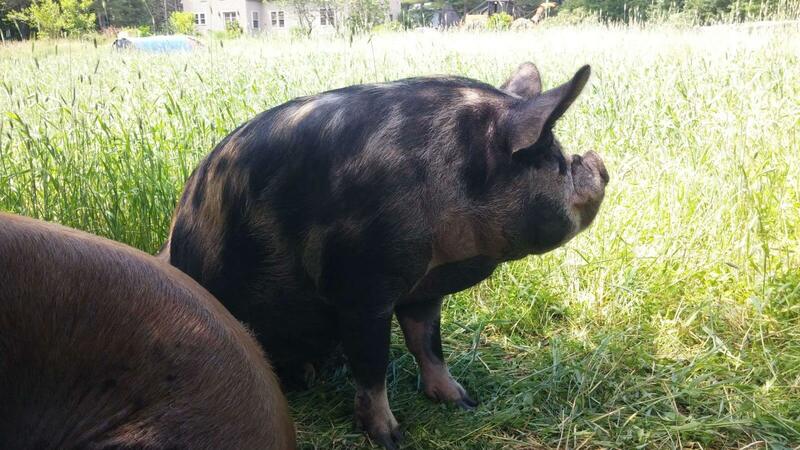 Pumbaa (Bandit line) is a tri-color boar piglet from Pennsylvania. He will be used as a sire for some of our Spring 2019 litters. 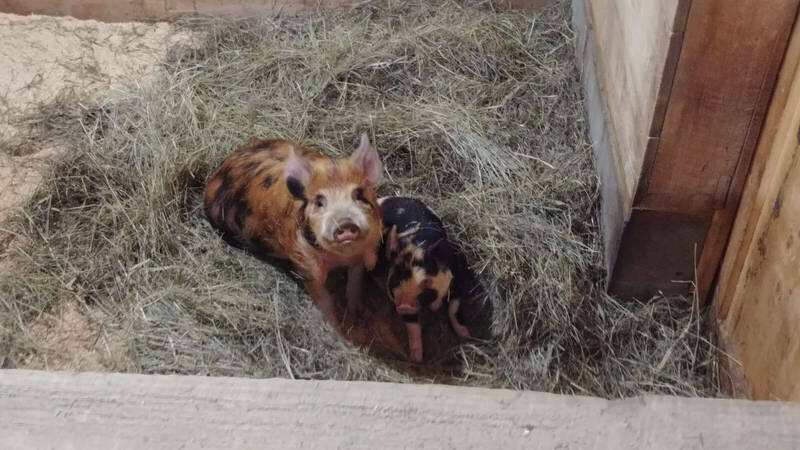 Contact us to be put on a reservation list for Spring 2019 piglets! 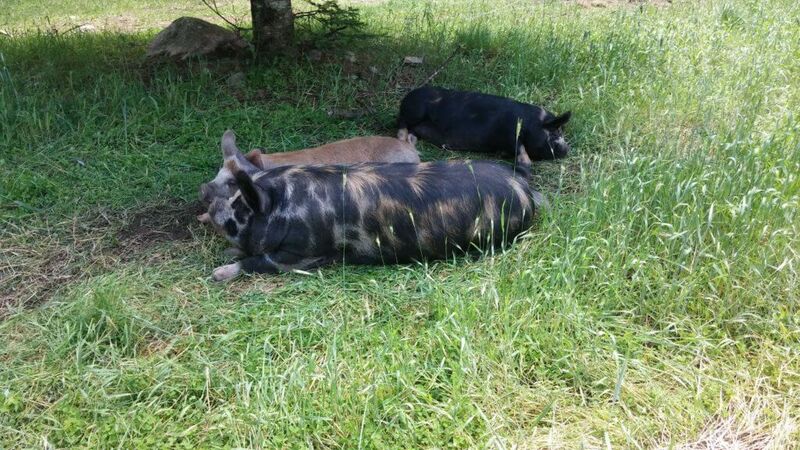 All pigs must have a wallow in warm weather, this is the only way for them to stay cool. When pigs are on pasture they will either create their own wallow out of necessity (which might not be where you you want it!) or you can create one for them on the edge of the pasture, preferably where rain water might collect or in a spot you can add water periodically to keep them cool. We create ours on either the edge of a driveway or edge of the forest where grass isn't growing anyways so we are not wasting good grazing! They usually won't say no to a kiddie pool either in hot weather! 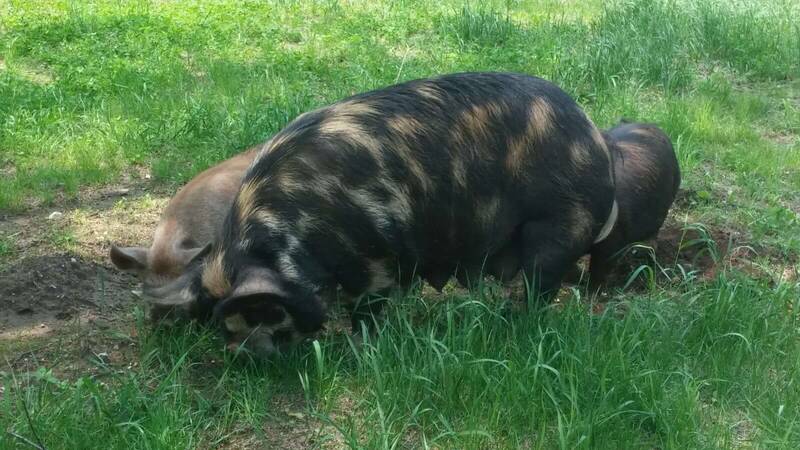 Moving the pigs around to fresh pasture is the best way to utilize nutrients and also to keep your pastures from being overgrazed. If your farm only has a small amount of pasture or you are raising pigs during a drought year we have found the best way to keep pastures from becoming over grazed is to have the pigs' main living area fenced in the woods and then to have different gates (fencing and gates on our farm consists of two low strands of electric poly or metal wire – super easy to put up and take down and fence in large areas) that allow access to grassy areas when you allow it. 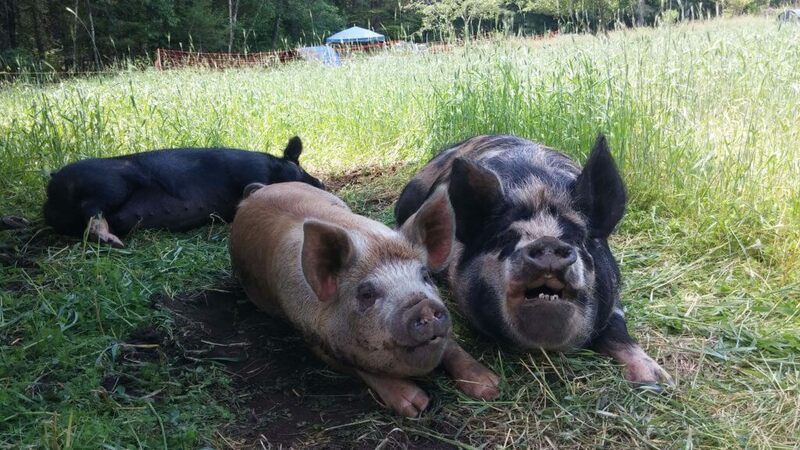 Ideally, pigs will get to graze everyday, but that depends on pasture size and whether it may be necessary to keep them off it to allow the grass to bounce back. If this happens it is good to supplement your pigs daily ration with some hay, as they will readily eat it to supplement the grass portion of their diet. The majority of our pigs are raised on two low strands of either electric metal or poly wire, as it is easy to move around and inexpensively fence in large areas. Younger piglets need to be trained to properly respect this, so they are started on either livestock fencing with an interior strand of electric fencing, or with electric pig netting, as both have a barrier that teach the pig to jump backwards when “zapped” by the fence, instead of charge though it as they may do with just two strands. 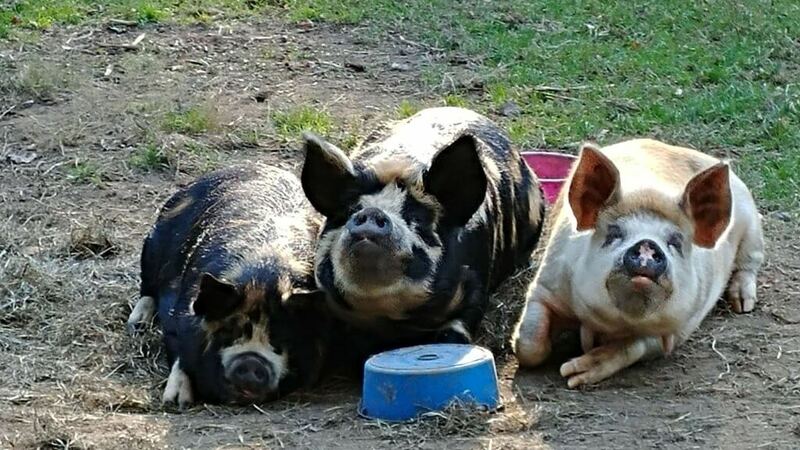 During the summer, pigs do well with A-frame type housing, calf hutches, or other enclosures that give protections from sun and inclement weather. We stuff pig houses with hay for extra comfort and to stay dry when raining. Similar housing can be used during the winter or barn stalls work well too. In winter we always make sure houses are filled really well with dry hay to keep piggies warm and insulated. 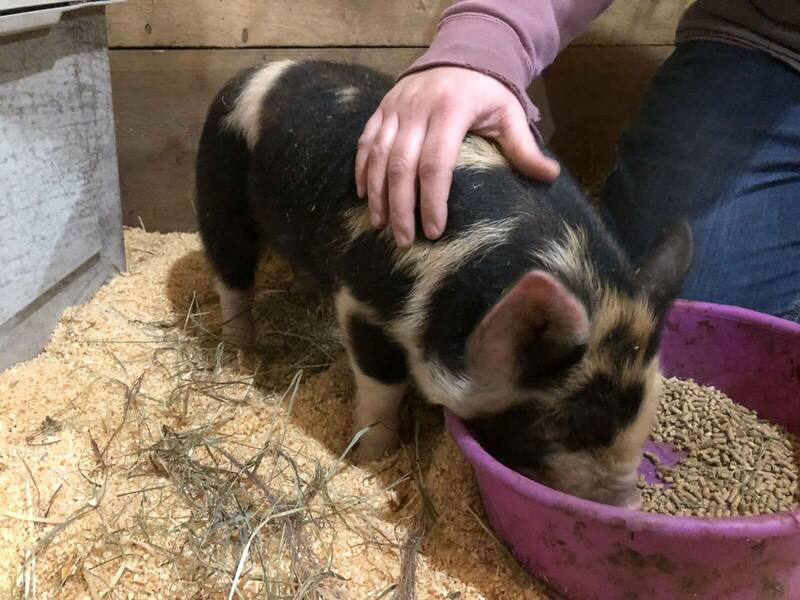 In addition to grazing on the grass in the summer or hay supplement in the winter (~2 flakes per pig per day), adult breeding stock and older feeder piglets get 3lbs (1.5lbs morning and evening) of grain daily (Green Mountain Organic for feeder piglets, Poulin Pig Grower for breeding stock). As a supplement we add 3 tsp/100# body weight of organic kelp top dressed to feed. 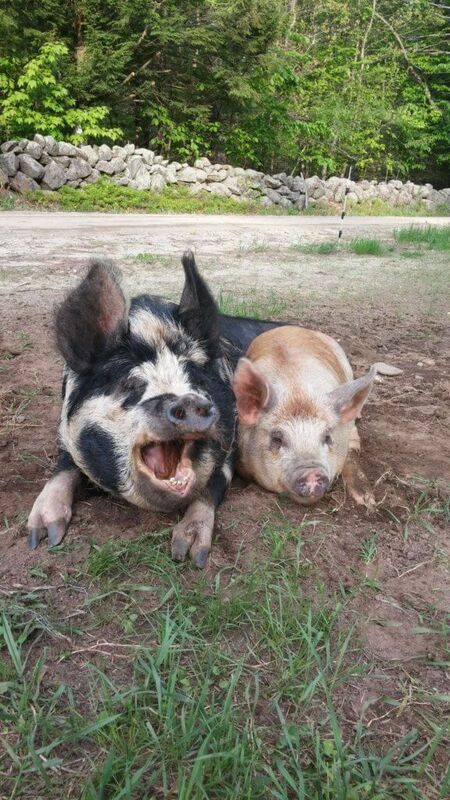 Piggies also never say no to fresh veggies, raw milk, boiled eggs, or drop apples!